​You are welcome to drop in on a practice! If you love to sing and want to take part in an exciting new hobby please come by and see us at a practice. Professional training or the ability to read music is NOT required. As long as you can sing in tune, we will teach you everything else you need to know. We are always ready to welcome potential members of all ages. If you have a question just drop us a note by email (shadesofharmonybarbershop@gmail.com) or by the Contact Us form on this website. Barbershop harmony is unaccompanied, four-part a cappella harmony. 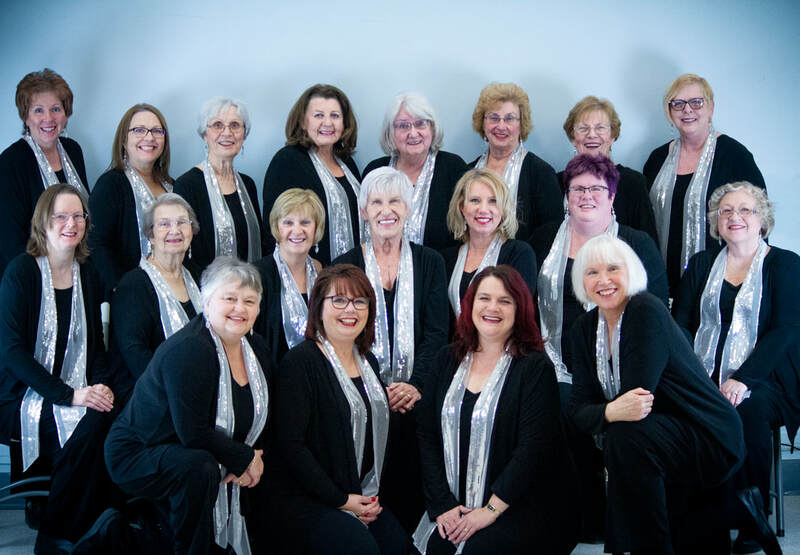 Although barbershop-style music is usually built on simple melodies and is relatively easy to sing, the a cappella style and the ear training necessary for independent part singing make it one of the most challenging and rewarding accomplishments of a vocal ensemble. The voice parts in barbershop for women have different names and functions than they do in other choral styles (ie soprano-alto-contralto). TENOR sings the highest note in the chord, sung consistently above the lead. BARITONE covers approximately the same range as lead. The baritone harmony notes cross the lead notes; primarily sung below and sometimes above, depending on where the melody is situated. BASS is the lowest note in the barbershop chord and supplies the harmonic foundation of the chord.